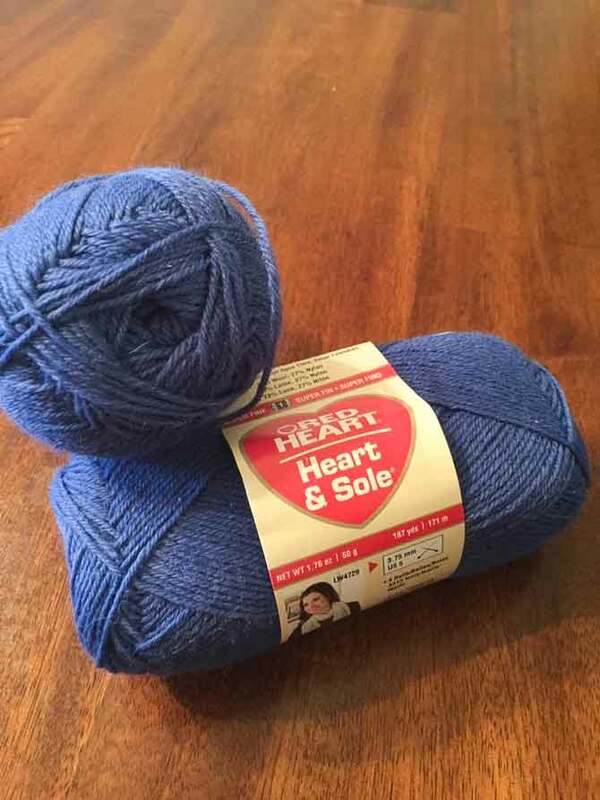 One thing I’m really looking forward to with Heart & Sole yarn is the color-work you can do! The solid colors are perfect for doing stitch work and using lots of colors. This can create some really interesting patterns. I saw a pair of socks that was completely made from color-work and they were, without a doubt, the coolest socks I’ve seen in my entire life. I have really been meaning to knit a pair up, and with this yarn thrown into the mix, I’m going to get back on the bandwagon with sock knitting. 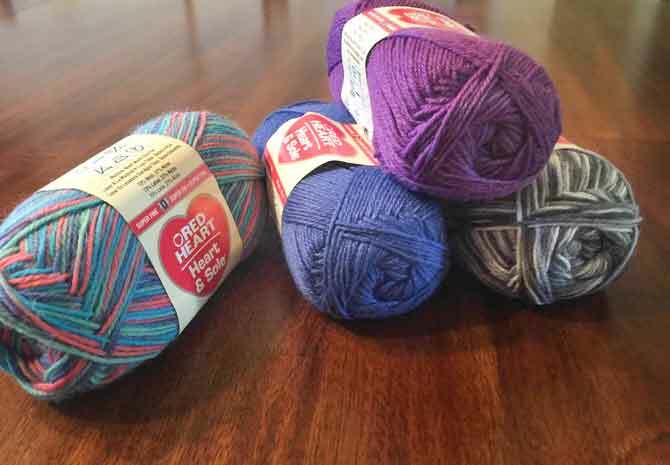 There are also optical illusion patterns online that this yarn would really highlight. When you’re doing really busy patterns you don’t want a lot of color variation in your yarn. The result would look way too busy and more like something exploded. I may have mentioned before but I love color-work, when you put that and socks together, it’s pretty much my ideal project! Have a mentioned that BLUE is a relative of PURPLE? They’re practically family! One other thing that’s really in right now are slouchy hats. I’ve only just started getting into these, but they’re a natural progression from socks. Hats made from sock yarn! I enjoy these slouchy hats because they’re thin enough that you can wear them as a fashion statement and not overheat, but they’ll also keep the wind out of your ears. There are a lot of very cute patterns online for free, but if you were looking to do something specific, a piece of grid paper and come pencil crayons would not go amiss either! I’ve created a few pattern repeats by just looking at graph paper and going with the creativity. I know that sounds a little wishy-washy, but once you look at a few of these patterns you’ll understand. There’s a pattern repeat, which is a grid, and after the ribbing you just repeat that X number of times (X depends on the pattern and length of the repeat). All of these colors are complementary to one another. If used in color-work the variegated ones will set off the plainer ones. If color-work in sock format scares you then the sock yarn hat should not be too scary. Limit the amount of colors to cut down on any anxiety as well. Something with five colors is naturally going to be more complicated than something with two. I truly hope everyone tries this out and becomes completely addicted to color-work as I am. Not to mention that you would need to make a hat to accent any scarves you made from this yarn. 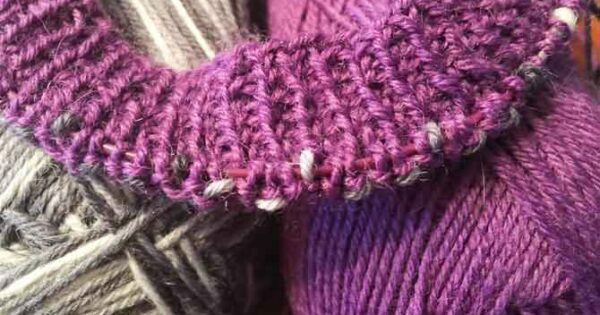 Now, if you’re the adventurous type, this yarn would be absolutely perfect for a light sweater. Many sweaters I see are knit with thicker yarn. I can completely understand, they’re quicker, easier etc, but the light weight sweaters are more flattering on any figure. Add in just a touch of body shaping and the amount of work you put in will be well paid off. 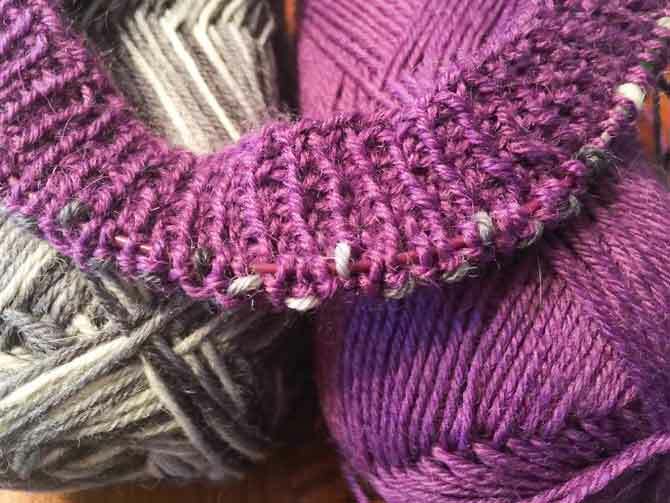 A row of color-work using Skyscraper with Purple. Hopefully everyone has taken inspiration in this post and is very excited to cast on a new project. With spring in the air I feel ready to cast on several things and just keep knitting!